You can take a tour of the Soviet War Memorial with your friends to spend some time knowing a little history of it. In a calm and peaceful park, this monument is located. The monument depicts communism that the soviets brought here. 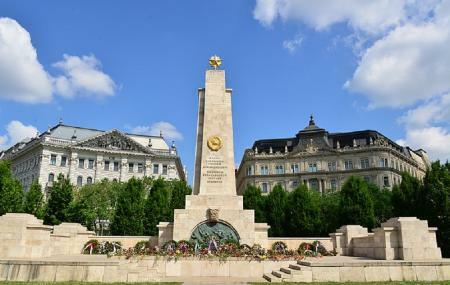 The monument marks the freedom of Hungary also. A lot of tourists come here to check out the Soviet War Memorial and the park it is located in. Your political belief can be anything but you will surely like the way the Soviet War Memorial got built. How popular is Soviet War Memorial? People normally also visit St Stephens Basilica while planning their trip to Soviet War Memorial. Large well kept monument that takes a prominent place within the park. 6 separate paths lead to this monument and it acts as a roundabout for pedestrians almost. An unusual sight in Hungary, the monument has the communist symbol of a hammer and sickle. Most of the remaining soviet monuments left have been moved to Memento Park. This memorial was built to commemorate the Soviet soldiers who died during the battle for Budapest against the German and Hungarian armies in April 1945 which led to the Hungary becoming a communist country for several decades. Nice monument and park to walk around for a few minutes. There's also a playground nearby for the kids. Find the statue of the Gipper for a neat photo opp. The Soviet War Memorial is the most interesting thing to see, with the statue of Ronald Reagan, at Liberty Square. Pretty tower-like monument within a decent garden in the memory of World War II heroes. Commemorates the Soviet era and it's locations is always of a question. Nevertheless, one of the most visited spots in Budapest since it is in the vicinity to the parliament.